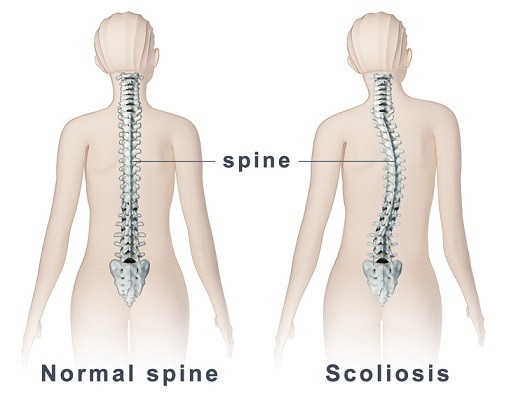 Characterized by a C- or S-shaped curve in the spine, scoliosis usually affects children but can develop in adults as well. You may develop it due to a number of reasons, including uneven pelvic position, genetics, foot or knee distortions, joint surgeries, or even head injuries. Depending on the cause, some curves can be quite deep. In moderate cases, scoliosis exercises may help correct the problem in your spine. Let's find out more about some common exercises you can try. This can help elongate your spine and is therefore one of the best scoliosis exercises to try. Identify the leg that appears longer than the other and start with that leg onto a small box. Slowly bend into the knee to lower your other leg down, while raising your arm on the same side. It means that if you are lowering your right foot to the floor, you should raise your right arm at the same time. Repeat 5-10 times and do at least 3 sets at a time. You should not perform the exercise using your other side. This exercise may also help stretch the spine and improve your posture a bit. Get in a kneeling position with an exercise ball placed on the convex side of your body. Slowly lean over the ball until it sets between the bottom of your rib cage and the hip. Use your lower hand and feet to balance your body and then stretch your upper hand at the same time. Maintain this position for 20 seconds and then slowly return to the starting position. Do 3 reps.
Get in a prone plank position. Push your hips up while keeping your arms stretched out straight. Maintain this position for a couple of seconds and then slowly lower your hips toward the floor. Be sure to get as low as you can without causing any pain to your spine. Do 2 sets with 5-10 reps per set. Looking for the best scoliosis exercises? You can use the foam roller to stretch your spine and help correct scoliosis to some extent. Get a foam roller, wrap a towel around it, and then place it over the exercise mat. Now, lie on to the roller in a way that it stays perpendicular to your body. Ensure that it is right between your rib cage and your hip. Keep your top leg in a straight position and slowly bend the leg at the knee behind you. Slowly stretch your upper arm until your hand is in contact with the floor. Maintain the stretch for 20 seconds and then return to the starting position. Be sure to perform 2-3 such reps.
Start with your knees on the mat. Get an exercise ball and lie on it in a way that your stomach rests over the ball. Now, relax your body and ensure that your back is perpendicular to the ball. Stretch your arms and legs and hold them out in a way that they are perpendicular to the ball. Stay in this position for 5 seconds and then return to the starting position. Start by lying down on the floor and then fold your knees. Keep a gym ball between your knees with your palms on the side. Now, lift your mid-body up by pushing your hips and maintain the position for 3 seconds. Slowly lower your body and exhale as you come down. Lie down on the floor with your knees bent and tucked in. Place your arms away from your body for support. You should keep your palms facing down all the time. Now, roll your pelvis gently from left to right. Lie down on the floor with your face towards the ground. Now, bend your elbows and put your body weight on your hands and toes. Squeeze your stomach in to tighten your abs and stay in this position for 5 seconds. Relax after a few seconds.